Breaking Bad asked us to get on board with a dorky science teacher becoming New Mexico’s premiere meth cook and dealer to support his family, in anticipation of his impending death by cancer. Most of us bought into that. 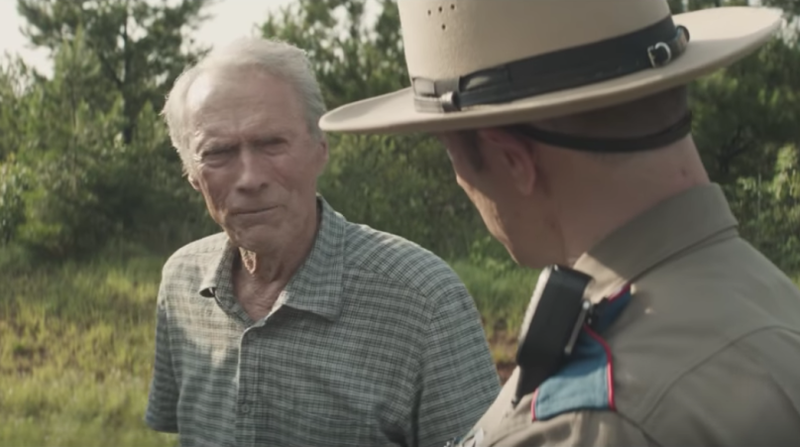 The first trailer of Clint Eastwood‘s The Mule wants to push our collective credulity a little further, as the 88-year-old screen legend plays an octogenarian drug runner concealing keys of cokes amongst sacks of pecans in the back of his flatbed. Sure thing! Eastwood’s second directorial turn of 2018, following the fact-based terrorism drama The 15:17 to Paris got the actual people involved with averting that disaster to play themselves, to enhance the reality of an unbelievable true story. Believe it or not, The Mule is also based on actual events, with Eastwood’s lead based on a World War II veteran in his who became a drug dealer and courier for the Sinaloa Cartel in his twilight years. Here the “reality” of the story is sold by Eastwood himself, appearing in front of the camera for one of his own films for the first time since 2009’s Gran Torino. As with that film, where he played a cranky old racist who dropped a not-insignificant amount of slurs during his screentime, Eastwood is again not being overly precious with the protagonist he’s cast himself as. This trailer is guided by a narration by the director/star’s Earl Stone, imploring an unseen interlocutor to live a better life than he. One which puts family first, doesn’t focus totally on work, and presumably involves less collaboration with South American drug cartels. This anti-hero gains a certain amount of sympathy when he looks like Eastwood: not only the face we recognise from decades of classic American movies, but also the face of a very, very old man. He’s being pursued in this teaser not only by the beat cop who pulls him over to rifle through his pecans, but also a more serious task force lead by Laurence Fishburne which features Bradley Cooper and Michael Peña amongst its members. The ensemble also include Taissa Farmiga, Dianne Wiest, and Clifton Collins Jr.
It’s directed from a screenplay by Nick Schenk, whose only other produced work is Gran Torino, so if it’s anything like that film — which balanced a tense crime drama with probing character piece — this Christmas release could be a surprise dark horse in end-of-year lists. The Mule is set for release on December 14 2018.